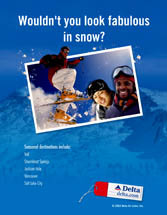 This is an effective ad for people who have the money to fly and ski. The obvious reference to "snow" as the white guy, wearing white pants no less, only adds to the suggestive tone of the ad and its targeting toward gay men of color. There's certainly no shortage of white guys on the slopes! This is a positive ad overall.